Cared for the `auwai (built in 1400 AD) that runs from the po`owai of Kānewai stream and removed excessive sediment that builds up over time, raked out leaves and twigs, to improve the flow of the `auwai. Gathered fallen leaves, and fed them into one of the lo`i that lay fallow. Then proceeded to hehihehi, to repeatedly step on the leaves within the lo`i to infuse nutrients back into it. 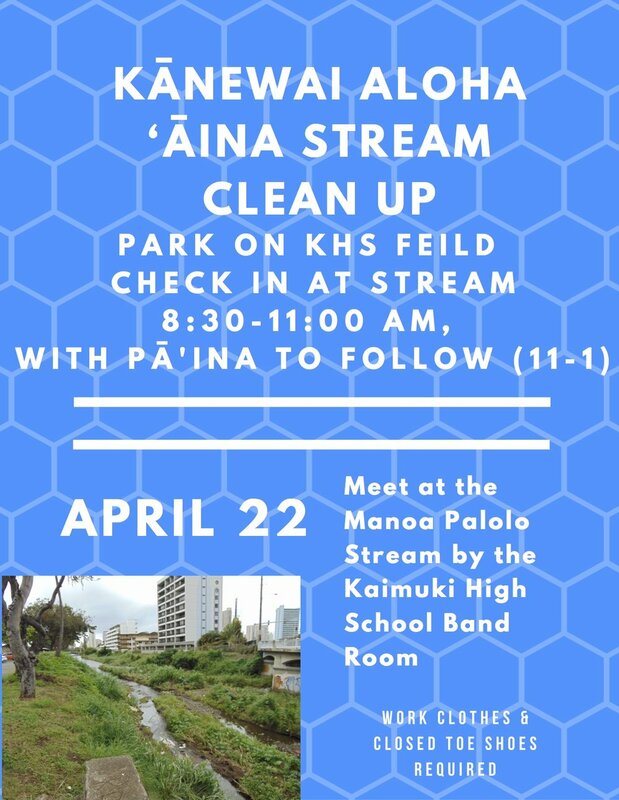 50 Students, Teachers, Parents, and Alumni from ‘Iolani School, Punahou Schoool, Our Savior, Kaneohe Elementary, Mid-Pacific Institute, Saint Andrews Priory, and Phillips Academy Andover! 1 Rockin’ Garden Expo with CTAHR Master Gardeners, Xeriscape Hui, Peace and Justice Club, 7th Grade World Geography Class, My Life, My Island, My World Class, Tower Gardens, Spoonful of Paradise, 'Iolani Apiary Club and 54 plants given away! Join us! We need your voices and your vision! Sign up here or email ychan@iolani.org and mkawatachi@iolani.org for more information. 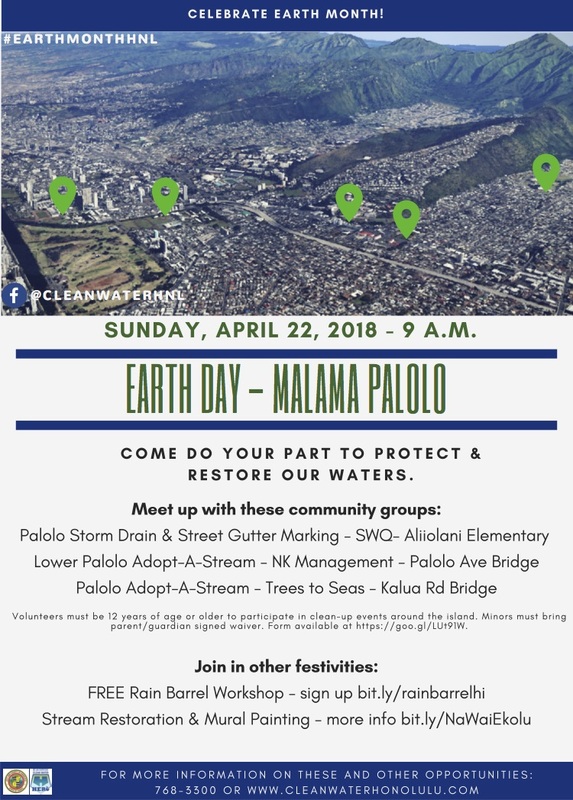 Please join schools and organizations throughout the Ala Wai Watershed for one collective day of service and help us in caring for the waters that flow into Māmala Bay! Choose a station and join the effort! Click on the map below for more information about each station. We are collecting data using the Litterati App! 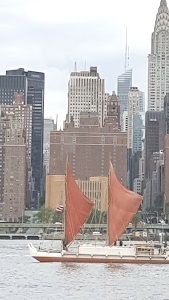 Join the Na Wai ‘Ekolu group to track our collective impact! *Some events are only suitable for volunteers 12 years of age or older. Minors must bring parent/guardian signed waiver. 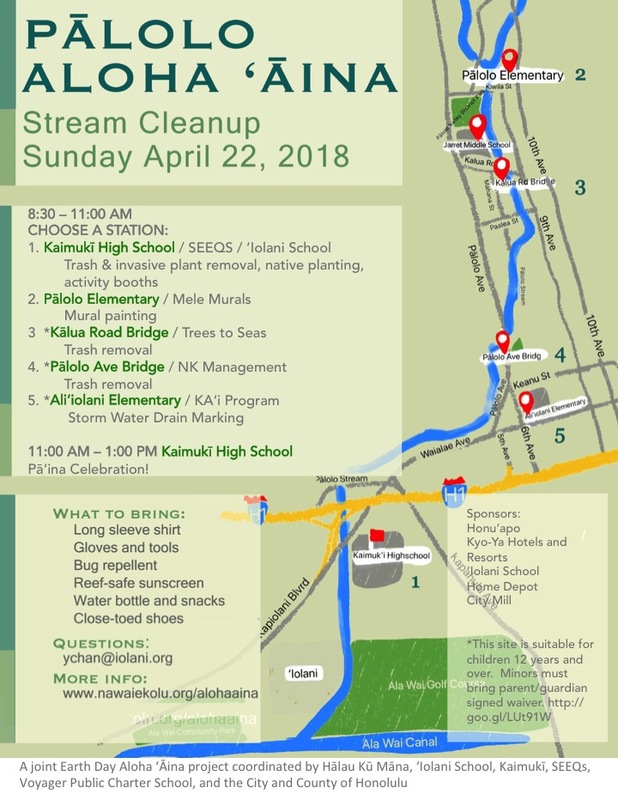 April 13 Woodlawn Bridge: Mānoa Adopt-A-Stream / Mālāma Mānoa 10:00am-12pm. More Information call 768-4319. Click on the stations below for more information on each site and the meeting place for each station. ‘Iolani School Station removed >1300 lbs of trash!